Someone who isn't willing to invest any money in their project isn't very committed to it. They are literally and figuratively not invested in it, so there's a high probability that they'll never finish the project. People will gush about how their project is special and promising and a guaranteed bestseller, but they're not putting their money where their mouth is. 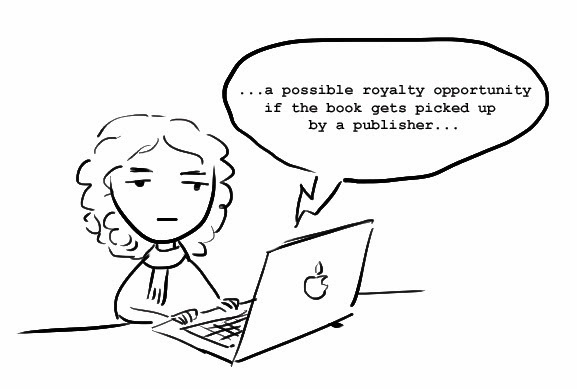 Someone who promises royalties "once the book is published" doesn't know anything about publishing. Most people think that the first step in getting published is to find someone to illustrate their book - but no, that's the publisher's job. So if someone promises that you'll get paid once the book is published, they haven't done any research into getting published - another sign that they're not serious about their project. Someone who promises royalties on a self-published book is not promising much. It's a sobering reality that self-published books generally just don't sell well. According to a 2011 survey, half of self-published authors earn less than $500 per year. Even if the project is completed, it's hard to get someone to pay you money on a repeating basis. Once you've delivered your illustrations, you're depending on this person to be honest about how much money they're making and to send you your cut. But all the cards are in the other person's hand - they have the illustrated product, they have the sales numbers, they're making money - outside of basic human decency, they don't have much motivation to remember to pay you. If you've signed a contract (which of course you should have), then you have legal grounds to sue them if they don't pay. But really, do you want to go through the trouble and expense of suing somebody? Will the royalties even be worth that much? Next time someone asks you to work on the promise of future royalties, "exposure" or "experience," just respond, "Thank you for your email. Unfortunately, I don't work on a purely royalty basis." I usually respond with a small description of exactly why I don't work for free or on spec, in the hope that it might make them think twice another time, but any email that drops in without a name, company or anything concrete attached to it doesn't even merit a reply – if you are going to send out emails that look just like spam, don't expect me to waste my time trying to figure out whether you are or not!